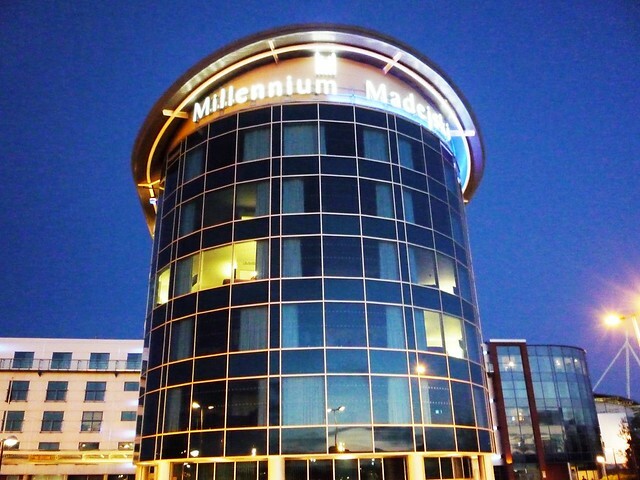 The Madejski Millennium Hotel, part of the Madejski Stadium complex in Reading. Photo by Victor Ochieng. Image used under Creative Commons License. Having achieved promotion in May 2013, talk has soon turned to how Crystal Palace finally has the opportunity to make itself financially sustainable – and build an infrastructure in which winning trophies at Wembley is a rather less rare occurrence. Whilst short-termism is endemic in football, from clubs swapping managers several times in a season to players moving through several clubs throughout a career, the very core of football clubs – their fans, stadium, and backroom staff – is what defines a football club, and what gives clubs their ‘family feel’ away from the money and hysteria of the matches themselves. So, what are the options for Crystal Palace? The choices for Palace lie with a complete revamp of the club’s home since 1924, Selhurst Park, a move back to the club’s original home at the Crystal Palace National Sports Centre (outside the London Borough of Croydon and into Bromley), or finding a completely new location. For the purposes of this article, we’ll focus upon the Selhurst Park option, the clearest option available for Palace; whilst a return to the NSC is a dream for many Palace fans, the considerable opposition from locals, combined with complex planning issues and the sheer cost of building a new stadium from scratch, make this difficult. Finding a new home across south London is perhaps even more complicated, with vast empty spaces which have great transport connections and room for further expansion rather tough to come by. Croydon has much to gain from a modern sports venue. Towns and cities comparable to Croydon, such as Coventry and Reading, have in recent years gained new sports stadiums (the Ricoh Arena and the Madejski Stadium respectively) which play host to much more than the local football team. The Madejski Stadium for instance, hosts London Irish Rugby Football Club, allowing the stadium to be in use every weekend in the autumn, winter, and spring. In addition to this, the Millennium Madejski Hotel and the Royal Berkshire Conference Centre is based at the stadium, allowing it to hold exhibitions and conferences on every day at the week. Perhaps a revamped Selhurst Park can also take inspiration from Coventry’s Ricoh Arena as a venue for music. South London, and Croydon in particular, distinctly lacks an open air music venue, in which the stadium and the club can gain revenue from summer use as well. Croydon’s newest music venue? Photo by Patrick. Image used under Creative Commons License. Andy Thornley, respected academic on the subject of the links between sports stadiums and urban regeneration, noted in 2002 that a sports team can be intrinsically linked to the marketing of a place. Thornley observed that new sports stadiums can change perceptions of towns with an industrial past (such as the De Kuip stadium in Rotterdam) or can promote a fresh outlook on the architecture of a place (such as Munich’s Olympic Stadium). He also argued that stadiums can regenerate local town economy – in Croydon’s case, that of Selhurst, South Norwood, and Thornton Heath – and allow locals to engage more greatly with a representation of the town which provides them with excellent facilities, be them sporting or otherwise. Perhaps most pertinently, he argues that stadium developments should not be isolated, but rather integrated into ‘broader visions of local regeneration and strategic city policy.’ Croydon has a fantastic opportunity to use a redevelopment of Selhurst Park to further drive a general redevelopment of the town. One must remember the massive exposure that the stadium will get, nationally and globally, were Crystal Palace to remain in the Premier League for a considerable amount of time. A modern, useful stadium could offer much in changing perceptions of Croydon. But why does Croydon need an arena fit to host conferences and concerts? If Croydon is serious about becoming London’s ‘third city’, then there needs to be more appeal than a beautifully regenerated Old Town, a shiny new shopping centre, or a major transport hub. There needs to be something which draws people in from miles around and is unique to the south east. If you wish, Croydon needs to become the ‘capital city’ of the south east of England. This means it must have somewhere businesses want to come to, artists want to play at, or an exhibition centre fit for the large area south of London. In this respect, Croydon has a great opportunity to host these events at a more convenient cost than Central London. What could better take advantage of this opportunity than a modern, Premier League football venue? How will this revenue flow back into the town centre and improve our lives as residents? The transport links between Selhurst Park and the rest of the country are often much maligned. This is always an issue which prompts a confused reaction from Palace fans, and rightly so. Alongside excellent bus links, Selhurst Park is a stone’s throw from three mainline train stations (Selhurst, Norwood Junction, and Thornton Heath). Those who are attending conferences or music concerts may need to spend the night in Croydon, eat out in the town, or go for a night out. As residents, we will have a new entertainment venue, funded by the Premier League millions flowing into Crystal Palace FC rather than through taxes, and a real attraction in the north of the borough, the area which needs most investment – vital one may argue, to prevent the majority of the wealth in the borough being based in the south and the centre. Next time, I’ll take an in-depth look at what exactly needs to be and can be upgraded at Selhurst Park. Not a football fan – but what an excellent article! Not a football fan – but then I read the whole article and engaged my brain. Having a functioning arena might actually be a great combination actually – combining the shopping center and transport links to form a holy trinity of reasons to come to or live in Croydon. As a musician and lover of music, it would be amazing if I didn’t have to trek across London to see stadium shows and what better way to proclaim that Croydon is a place to go than the big stadium bands playing here? Okay, there are better ways, but it’s a bold statement given our current gutter kicked status. Hi Tom love the article has really swayed my opinion on Selhurst park being a resident in Thornton heath most of my life and having worked there in the old car park like Arthur Wait stand. I live near the university hospital but have always found the crowds passing through to get to the stadium to be a nuisance when just trying to go about daily life. I like that you mention Coventry as I studied there for four years and have visited Reading and totally understand what you mean about the regeneration well relocation in Cov’s circumstance. Only weeks back the Ricoh hosted one of Muses concerts and years before that the Take That Circus concert. I was one of the biggest fans of the Arrowcroft arena for the reasons that you mention a redeveloped CPFC stadium being a great idea. Seeing how the Olympic park managed work with just the use of public transport was amazing and it always makes me think could it have been the case here since that site has alot of transport links. Its really refreshing to read of another Croydonian talking of a large venue and not assuming everyone will drive there since a lot of people don’t drive. Talking to my dad we always wondered had CPFC had the money and everyone was on board maybe valley park would have been a great spot before it became a retail park. Thinking of the Ricoh it would be a similar location only a lot closer. To me thats the Ricoh’s one downfall that its so far from the city centre of Cov but in Coventry’s case they have the ring roads and I guess there was the space. Maybe the question I am about to ask is in the next part of this article but I’ll ask do you think in terms of room to expand in the future a redeveloped stadium could be located more centrally on the current site? We can all see its currently boxed in on three sides. Maybe the Olympic stadium could be a source of inspiration for creating a new stadium thats not really expensive. Watching the programme about its design its interesting that it also faced the big issue that the site it sits on wasn’t even big enough for the average modern Olympic class/sized stadium. Had they built a birds nest or even Wembley sized stadium it would have being hanging over the rivers surrounding it. I love the idea that it could be an open air concert stadium as I totally agree this would bring more people to my area. I would also hope it might then in due course attract others sort of like the Bilbao effect. Thanks for writing this article and I really look forward to the next part. Sure – there is some talk in the next article about it, creating steeper stands would not only improve the views but would allow the same or a greater number of seats to be placed in a smaller footprint. Of course, this would then impact upon the houses surrounding the stadium in terms of how high the stands actually go – but I’ll discuss this in the next part. Was looking at a few stadiums such as the Amex then happened to come across Molineux via a link about Selhurst park on Wikipedia. Really gave a good insight into what you’re describing in this article. I think it would be great if there were a plan to re-clad the facade in a similar sort of way to what I’ve seen of Foster and Partners idea for the nou camp or nou nou camp as I like to call it if it happens lol. I guess in the scheme of things the most important aspect is the capacity and facilities inside which in Arthur Wait were grim. I will always remember working on the burger bars and getting annoyed at the fact fans get pissed off cause its like 200 odd people walking into the eastenders cafe and expecting as fast service as the McDonalds in the Olympic park. Holmesdale standard being far newer looked great with people just cooking and the others just serving. Looking at the customers/supporters was like a sea of the angriest people you wouldn’t want to meet on any day and you could understand why. Toilets were just as bad as the closed ones round the side of poundland in the whitgift. I see you have an interest in property management do you also have an interest in architecture? Maybe this is something that you will bring up in the next part and feel free to say that if it is. Do you feel the fans are more interested in the experience of watching the game, capacity so more can go to see matches more so than the aesthetics of the stadium? I think the core Palace support, of which I’d say there are about 15,000 people who’d watch Palace whatever the state of the stadium, are more interested in watching the match. I think it’s the ‘casual’ fans – those that will go to the occasional game – whose experience will be defined more by the whole matchday experience, which includes the stadium aesthetics. To become a really big club Palace would need a great stadium to keep these fans going every week. Whilst I’m doing a degree on property sadly I can’t claim to be an expert on architecture at all! I do have some ideas about stadium architecture though – the next article won’t really focus on these, it will more be about the practicalities of stadium development, but I’d be really keen to hear your thoughts on the architecture part. I thought that might be the case having seen some of the opinions put forward from some die hard West Ham fans in opposition to the Olympic stadium despite the reports the current site is past its best and would need extensive structural work in years to come. I graduated in Transport design last summer so beyond what I’ve read in books, viewed on the internet and on documentaries about stadium design can’t say I’m that knowledgeable. I guess I come at the stadium as a hope of the owners wanting to put their best foot forward in the way the romans did with the Colosseum I guess. I guess tbf the club does have the odd community based event but as you say a really modern stadium would attract the casual fan. In my case the idea that it might attract concerts would definitely attract me. I do find the whole practicalities of development just as interesting. As Croydonians we all know you can come up with all the best laid plans but if finance and all the other factors leading to the finished article aren’t in place nowt will happen. I tend to have quite blue sky thinking but thinking back to visiting the nou camp it was during the time when the pitch was being lowered to increase capacity. I didn’t realise that was how it was done till reading about it today. Do you think this could be an option as well as maybe shifting it over towards the car park a bit to get around shaving off a bit of the height increase. I’ve never really been keen on the aesthetic of 4 separate stand so I’d love to see the corners filled in but in a way that makes it look seamless opposed to lopsided like st james park. Funny thing is I’m not a fan of football, don’t hate it just not very passionate about it at all but love stadium design. I asked my dad this last night as you mentioned the great transport links in the form of the tree stations serving selhurst park. Do you find that the majority of fans use public transport to travel to games I’ll widen that to coaches? In an ideal world, I think lowering the pitch would be a great idea as low rise (looking from outside the stadium) stands could be built which have a great capacity inside. Unfortunately, the basement of of Holmesdale Stand (the double deck in the pic) is flooded, meaning perhaps the water table underneath the pitch is quite high, so the grass itself would be prone to flooding. That same stand is still also quite new and has good facilities and capacity so I doubt the owners would want to knock it down. 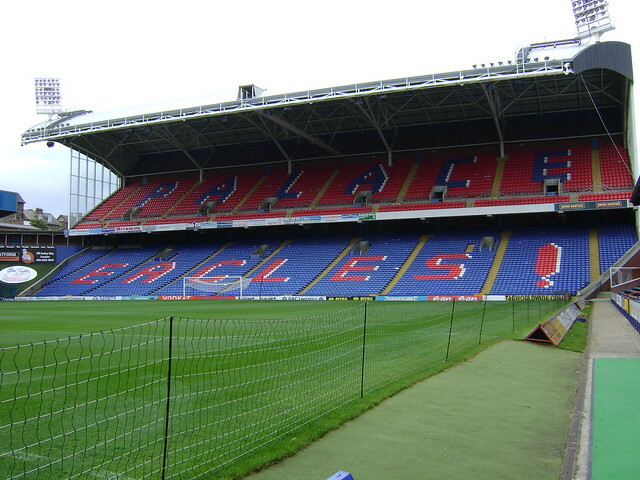 Certainly understand where you’re coming from with four separate stands – but the general opinion of most Palace fans, myself included, is that we wouldn’t want to see something like Leicester’s ground , the King Power Stadium, which looks very similar to Southampton’s, St. Mary’s Stadium amongst many others – fans want something which is definably ‘Crystal Palace’. Personally, I’ve always like Deepdale in Preston, as a stadium like this gives each stand its own ‘character’, I’d be very happy if Palace did this on a bigger scale. It’s definitely personal choice though! I couldn’t give a definitive answer on how many fans use public transport – certainly all three stations are packed after games though and the car park at Selhurst isn’t really used by Palace fans, if they drive they usually park in quite a large radius around the stadium. As for coaches, a good percentage of away fans use them, although given that over 25% of our opponents in the Premier League are from London, I think more will use public transport in the coming season.